It could be a lot tougher to get help enrolling in Obamacare this fall. 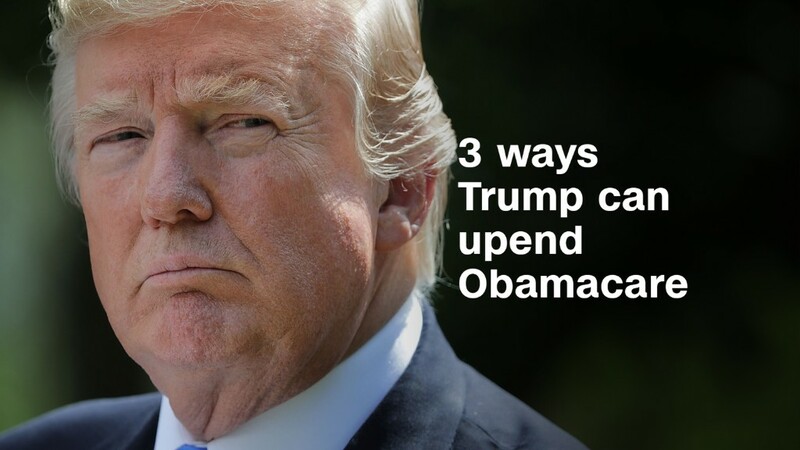 More than 8 in 10 groups that assist people with enrollment say they are getting less federal funding from the Trump administration, according to a new report from the Kaiser Family Foundation, a non-partisan research organization. These groups, known as navigators, provide outreach, education and enrollment assistance to those applying for policies on the Obamacare exchanges or for Medicaid. Navigators knew that the program was going to take a hit. The Trump administration announced in late August that it would reduce their funding by 41%. The 98 groups received a total of $37 million for the upcoming open enrollment season, which runs November 1 through December 15. Cutting the navigators' budgets is only one change the Trump administration is instituting this year. It is also slashing advertising by 90% and taking the federal exchange offline for maintenance more often than in prior years. Critics say these moves will undermine sign-ups. 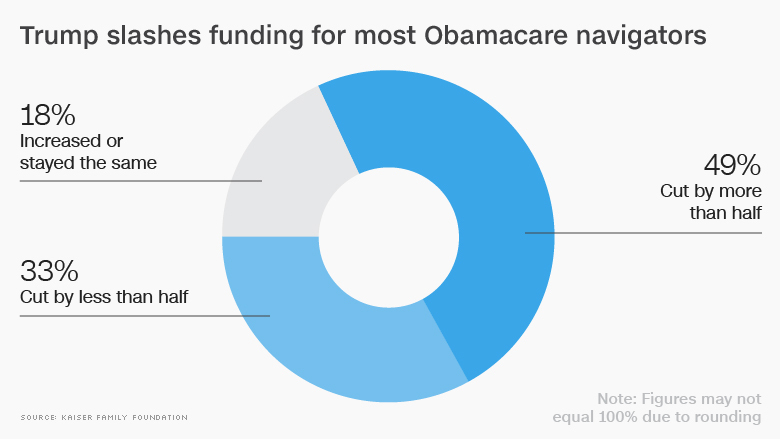 Some 49% of navigators had their funding cut by more than half, according to the Kaiser survey. Another 33% saw reductions of less than half, while 18% received the same amount as last year or more. The administration said in August it was revamping the program after more than three-quarters of the grantees failed to achieve their enrollment goals. Navigators signed up roughly 81,500 people in 2016, officials said. 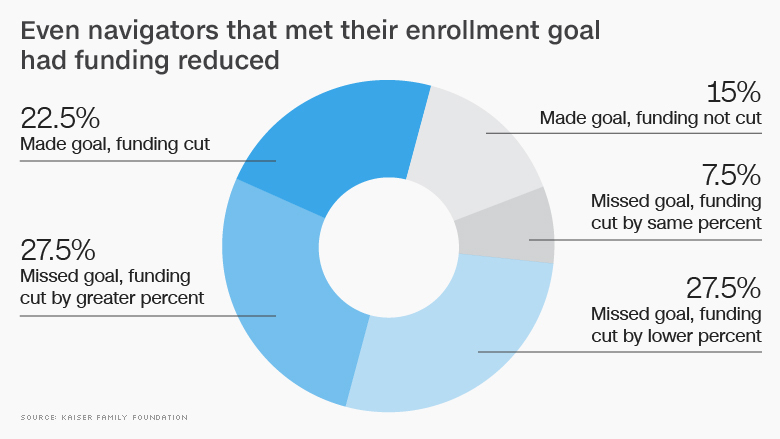 For the coming season, their funding would be based on their prior performance -- so a navigator that enrolled only 30% of its goal for the 2017 enrollment period would receive only 30% of the funds. Navigators, however, told Kaiser that federal data did not always accurately reflect the number of consumers they enrolled. The groups measure their efforts in two ways -- self-reported figures and data collected by the federal exchange, healthcare.gov. Sometimes, navigators didn't consistently enter their identification numbers on their healthcare.gov applications. In other instances, the federal data just didn't match the groups' records, according to Kaiser. Kaiser found that the funding the groups received for this coming season often did not correspond to the self-reported enrollment figures given to the Centers for Medicare and Medicaid Services, which runs the federal exchange. For instance, 22.5% said they made their goal, but still had their funding reduced. Another 27.5% missed their goal, but had their funding reduced by a larger percentage. Related: What happens to Obamacare now? In addition, the federal data doesn't capture the number of people who completed enrollment on their own after getting help from navigators, nor does it reflect those who were enrolled in or referred to Medicaid. CMS did not return a request for comment. Despite the funding cuts, most navigators will continue to operate in 2018, according to the Kaiser survey. 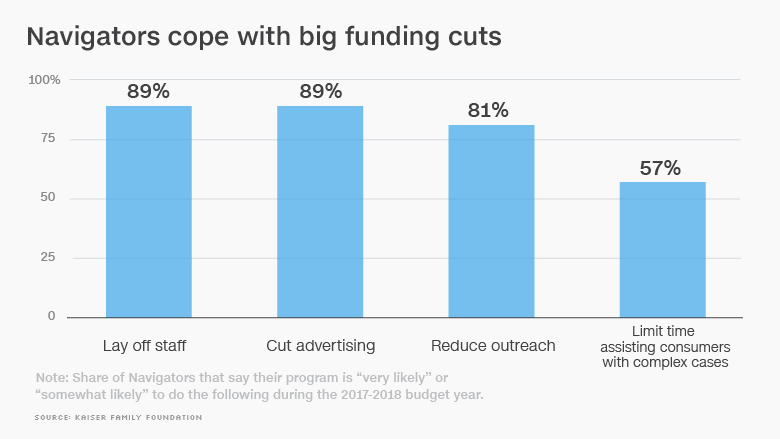 But nearly all expect to lay off staff, reduce their advertising and curtail their outreach programs. Many said they will likely have to serve fewer areas, particularly rural communities.